A bus route is a route that the bus takes with different beginning and end points and other stops along the way. To make the destinations on the bus route easy to understand, route numbers are made up with user-friendly numbers and letters. Routes that depart from, arrive at, or pass through Sendai Station have three-digit numbers, while routes that depart from and arrive at subway and JR stations have two-digit numbers. Numbers are the same on outward and inward bus routes. 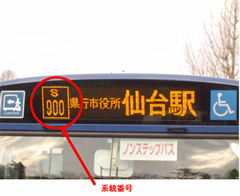 Three-digit route numbers are routes that depart from, arrive at or pass through Sendai Station. Sendai Station is considered the center of the bus routes and the first two digits of the route's numbers show their general direction in relation to Sendai Station. Some routes have alphabetical letters. 1. Inward services heading for the city center include the following alphabetical letters according to the destination. 2. When multiple services operate on the same route, the following alphabetical letters are included on routes that end at City Bus Operation Offices, Branch Offices, Subway Stations, etc.